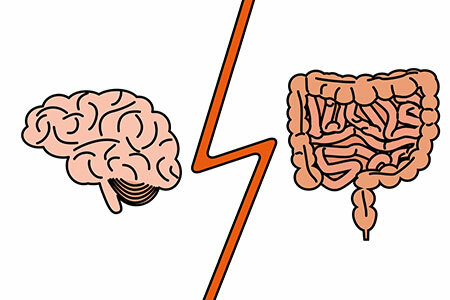 The gut microbiome may contribute to or modulate the pain of visceral hypersensitivity, but how the microbiome affects neurotransmission, pain perception, and GI function is not well understood. Pokusaeva and colleagues hypothesized that production of the neurotransmitter γ-aminobutyric acid (GABA) by gut bacteria such as Lactobacillus and Bifidobacterium might be one mechanism through which the microbiome-gut-brain axis functions to modulate visceral pain. The researchers identified Bifidobacterium dentium as a human commensal microbe which secretes significant quantities of GABA via metabolism of glutamate mediated by the gadB gene. B. dentium is found in healthy children and adults. In experiments using Swiss Webster and C57BL/6 mice, increased GABA production was found in mice receiving B. dentium or another Bifidobacterium species, B. breve, which had been transformed to express gadB. "...colonic-specific sensory neurons are hypersensitized following luminal distention associated with FR, and this hyperexcitability phenotype is inhibited by GABA-producing, gadB-positive B. dentium and not by a genetically similar non-GABA producer." In this work, the researchers demonstrated neuromodulatory effects mediated by a commensal microbe producing a neurotransmitter. They cite plans to further explore the mechanism of GABA signaling in modulating visceral hypersensitivity. Furthermore, this paper suggests the interesting conclusion that GABA-producing microbes might be beneficial probiotics able to reduce visceral pain. Such a probiotic therapy could bring some relief to patients with GI disorders, such as irritable bowel disorder and constipation. ← What Are Germ-Free Mice and How Are They Sourced?